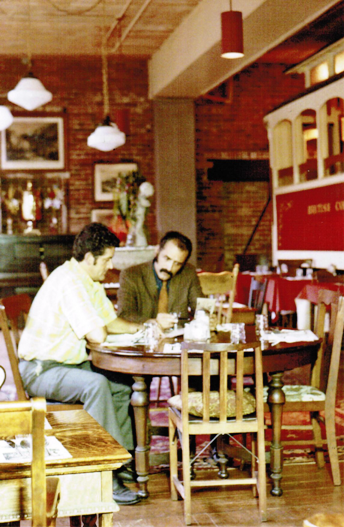 Taken at The Old Spaghetti Factory in Gastown, one of Vancouver's most recognizable landmarks, the picture depicts two of the Pulos brothers in 1970. The first Old Spaghetti Factory was opened in Gastown in 1970 by the three Italian-Canadian Pulos brothers. It was their first restaurant. Although the Pulos brothers later sold their wildly successful business to The Keg, they are immortalized here, perhaps discussing their expansion plans, in this charming sepia-tinged photograph. The Old Spaghetti Factory turned 40 in 2010. Click HERE to see more of Dan's photos, writing, and music. You may also contact him at 604-277-6570. If YOU have any stories, photographs, or other interesting things to share with BC, whether it's restaurant-related or simply Canadian, let us know! We will be happy to post it here for you.